Lee County’s Republican-led board of commissioners were warned of the county’s potential liability of its recent controversial “town hall meeting” at Carolina Trace last week, according to an email obtained Wednesday by The Rant. The memo suggests Parks and the other commissioners were warned in advance that the meeting would create legal problems. 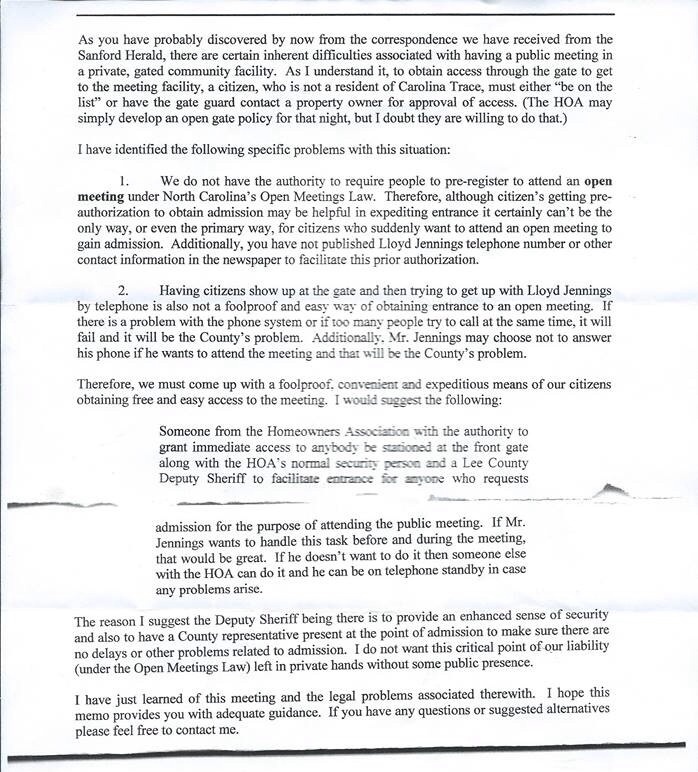 “I do not want this critical point of our liability (under the Open Meetings Law) left in private hands without some public presence,” the memo reads, after a suggestion that a deputy sheriff and a representative of the Carolina Trace Homeowner’s Association be present to wave meeting attendants through the gate. The author of the memo, as well as the recipients and the date, have been redacted, but multiple credible sources have confirmed to The Rant that the document is authentic. Jennings is the founder and president of the Lee County Americans for Prosperity chapter, a national group which promotes right-wing candidates for public office. Two days later, The Rant obtained an email from a Trace country club official advertising the town hall as an opportunity not just for county commissioners to update residents on county business, but also an opportunity for residents to interface with several other Republican officeholders and one Republican candidate for the county board. Next Next post: BIZ: Sheetz, IHOP on the horizon? You might have to eat those words. If this document does turn out to be advice from counsel or the county manager to Parks, then this is evidence that the BOC leadership knowingly violated the law. As it stands, it is evident that the law was violated, anyway, but it’s worse (and could put the county at financial risk) if the board did not follow the advice of counsel.